The moment you take the Supertooth HD Voice out of its box, you will fall in love with it. The black matt finish, the spaceship like design, the dome-shaped volume control, the fine illuminating lines along the smooth edges - everything about this is super cool. But the best is yet to come. This is the best of all the in-car Bluetooth speakers we have tested so far. Supertooth can connect up to two handsets at a time and pairing with a device is as easy it could be. Our Nokia Lumia 920 paired instantly with the device soon as we switched on the Bluetooth on both devices. The process was as simple with the iPhone 4S. Upon connecting a handset, Supertooth automatically detects the phone-book and imports all contacts. This is put to use when you are voice dialing a contact and also helps the device call out the name in case of an incoming call. This way, you won’t have to take your eyes off the roads. It is perfect for states that have restrictions on cell phone use while driving and will allow you to stay focused on the road and other drivers. Press down the volume button and the speaker will initiate voice commands. Hold it down for three seconds and it will redial the last number. At any point, say "What Can I Say?" and the SuperTooth HD will start a minute-long tutorial. The sound quality on the SuperTooth HD voice is fantastic and it comes with dual microphones for noise cancellation. The voice is loud and clear. Even with the windows rolled down and the caller heard our voice clearly. However, we were told a couple of times that it sounded like there was a bad throat on our side of the call. Upon connecting a handset, Supertooth automatically detects the phone-book and imports all contacts. Although, most cars in 2013 come equipped with a Bluetooth hands-free sound systems, the SuperTooth HD will be handy for those with older cars. The A2DP capability even enables it to call out loud the directions on the phone's GPS. 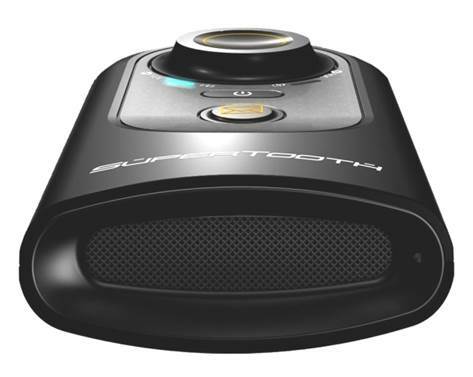 The SuperTooth HD voice comes bundled with a data cable with an in-car charger adapter. Upon full charge, the unit can give up to 20 hours of talk time, or over a month of standby time. Overall, the SuperTooth HD's easy operation, loud volume and added features earn it brownie points over other in-car Bluetooth speaker systems in the market. The sound quality on the SuperTooth HD voice is fantastic and it comes with dual microphones for noise cancellation. Bag it or junk it? Worth buying if you spend a lot of time driving.